Everyone needs a little inspiration every now and then, especially, during their big day. The Inspiration white with silver lace border collection is a classy and sophisticated disposable plate for weddings. These plates and dinnerware are beautiful and will make your special day even better. A Party Source has dedicated itself to selling plastic plates for weddings and special occasions. You can't go wrong wit the Inspiration collection of dinnerware and cutlery. 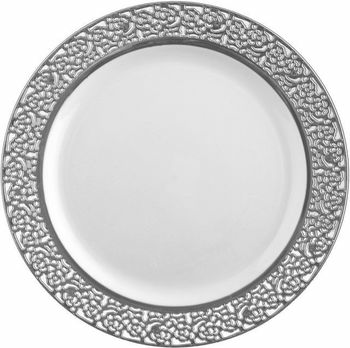 Inspiration 10 1/4" White w/ Silver Lace Banquet Plastic Plates 10ct. Inspiration 9" White w/ Silver Lace Border Luncheon Plastic Plates 10ct. Inspiration 7" White w/ Silver Lace Border Salad / Cake Plastic Plates 10ct. Inspiration 12oz. White w/ Silver Lace Border Plastic Bowls 10ct. Inspiration Clear w/ Silver Border Plastic Wine Goblets 10ct. Inspiration White w/ Silver Lace Border Serving Trays 2ct. Inspiration White w/ Silver Lace Border Serving Trays 20ct.